Jan 21, 2015 - I took delivery of the 8" Encore 2 Write (with stylus) yesterday. I'm an experienced tabpc geek with a t904, Samsung Slate, and 21" Cintiq UX, & ipads. This thing gave me one of the best first experiences with a new piece of tech in a long time. I got it on a whim to have a super portable note and sketchpad. Really incredible for the price point. So far I've tried full versions of OneNote, Sketchbook Pro 6 and Powerpoint 2013 (I like it as a scrapbook/sketchboard) in addition to metro versions of FreshPaint, Sketchbook Express. Exceeding expectations. Wacom pen is nice. This picture (right) is taken in Manga Studio 5 with strokes from a 54 pixel Gpen done lightly to mid pressure in clockwise direction... Manga Studio allows you to adjust pen curves and I have mine set to require a bit of pressure to start the line. Frankly this pen is as as clean as anything else I have and I have almost all the Wacom products including a Cintiq and 3 tablet PCs. I'm happy to try other small tests for the curious, but I won't be installing Photoshop on this unit. I'm under a lot of deadline pressure right now and this is just a side show. So anything really complex might take me a while. MS5 is really cool with small to medium canvas sizes. The processor starts to choke on really large brushes with gnarly textures moving fast. But for doodles and small renderings, it's very satisfying. The multitouch pan, zoom and rotate works great in MS5. Not so great in Sketchbook Pro6. $349? I know we're a picky lot but this thing is way better than I expected for that price. Jan 21, 2015 - I have noticed a few stray marks from sloppy palm rejection, nothing troubling or unusual though. But again, the totality of the experience is quite good so far. I usually try not to write reviews or declare judgments until I've had gear for a while, but my initial enthusiasm for this tablet is quite high. You are welcome to keep me honest! PS. I'd never measured it before but my Fujitsu t904 hover distance is ~ 0.45" for those who are keeping score. Jan 22, 2015 - Qualitative impression: The thing that seems to make styluses have the tic tic noise is the 1) hardness of the tip material, 2) looseness of the tip in the pen, and 3) hardness of glass or coating. Shown here is the Toshiba stylus (left) and two Fujitsu / Wacom pens (right), one with black fiber tip and one with white plastic tip (NOTE: These tabletPC pens don't work on the Toshiba - this is for comparison only). The black fiber tip is nearly silent, the white plastic tip is quite clicky. I don't like the sound or the feel of the white tips. The Toshiba tip is right in between - may be closer to the back tip in terms of both sound and feel. I like it. And as you can see, it is new but slightly fiberous/textured tip so my guess it is will get a little quieter with use (my black pen looks and feels like an old Sharpie marker). The tip is slightly looser but its not bugging me and I really hate that loose feel. So in a perfectly quiet room the operator can hear some tic but I don't think it would bother anyone in an office, classroom, or home. All tests done after 2 Starbucks coffees. Some jitter may be operator error! Speed of slow drag is noted as seconds from beginning to end. My handwritten notes are approx 0.2" high. Full sized images may appear quite larger on a PC monitor than they are on the device itself. The real world Screen dimensions are 6.75" x 4.25". SO to get an accurate feel for the real world device make each image that dimension on your physical screen. Some strokes were done using a plastic straight edge or french curve to reduce user jitter and are noted separately from "Freehand"
MS5 has user controlled stroke smoothing which I turned off except where noted. A small pilot pen without smoothing is close to the worst case scenario is MS5. The Third Screen capture demonstrates MS5 with a single "virtual old Sharpie" pen with a larger pressure sensitive tip and a slight texture. All strokes done without adjusting pen settings other than color. PS: I do not have screen protector on the glass. I think a little texture over the glass would create some helpful drag. I'll try that next week perhaps. I don't think I could draw a lot smoother at that size with a physical pen on glass. IMO: There is very little jitter caused by the digitizer. I've seen worse on my Cintiq. Jan. 25, 2015 - 1) A quick test of the pressure sensitivity of the new TruPen in Manga Studio. - Test 1 uses a 500 pixel G pen on a 1920 x 1080 canvas done in a single stroke going from minimal thickness to full thickness and then back again. You have to blame some of that jitter on my shaky hand and the raw glass surface. I did this stroke very slowly. I have a matte screen protector coming this week - the screen needs more friction IMO. - Test two is with a 1000 pixel G pen on a 4000 x 2800 pixel canvas. There are not very many cases where you would need to go from one pixel to 1000 pixel line in a single stroke but it serves the purpose of illustrating that the new Wacom pen does have fairly impressive sensitivity even on this little budget tablet. At full thickness the stroke line was dragging a bit behind the stylus. On the other hand I was very impressed with the fine line sensitivity and control of this very large brush. I pulled this stroke more quickly which helped the smoothness. 2) The other thing that I did on a whim was download and install the free version of Sketchup (Make) 2015. All the modeling tools and functionality seem to work fine on this budget processor with 2 GB of RAM. Basic modeling is actually very responsive. Then I went to the Sketchup warehouse and downloaded a 4.2 GB Chevelle model, turned on textures and shadows and then dragged and rotated the model around in various positions. It was a little bit draggy but it didn't break. And for my use, the idea of having simple Sketchup models that can be used as underlays to block out some layouts is very valuable. Obviously it doesn't make any sense to do serious modeling on this little tablet and I don't mean to imply its suitable for anything other than simple blocking. But I was surprised that it worked at all much less worked as well as it did. Jan. 26, 2015 - Battery life is OK. Not spectacular IMO. I haven't done a formal test locking out variables like WiFi and power optimization. It seems to me if I leave bluetooth and WiFi on and do sketching and note taking and mixed file management it might be slightly more than 5 hours. That's also connected to a Skydrive/one drive with multiple apps open, I have done no tweaking yet to the brightness/battery config. All of that is "out of the box". I'd like to do a hypermile test to see what it will do with tweaks for long battery life but I have too many networked requirements for all the other evaluations and set up I'm trying. Jan. 28, 2015 - The goal of this exploration was to evaluate the suitability of the Toshiba Encore Write 8 for PDF viewing and annotation. This is a much longer answer to the basic questions that was asked. This digital annotation and note taking topic is of great interest to me and it has been for a long time. So, this gave me a chance to drill in a little bit with the my new Toshiba Encore 8. Real success of a mobile note/sketch pad for any one person is whether or not we are using the device on a daily basis for note taking in six months or a year. I'm sure we've all had plenty of occasions where we get excited for a month or two but then fall back to whatever we were doing before because it works better in the big picture. Significant improvements in the overall experience come from some combination of hardware + software + ecosystem. How that all works in the real world for someone is multivariate. So I'll provide my short answer on top and then a longer dialogue about my full impressions. I don't have particularly great reading eyesight anymore. I wear glasses. I can spend long periods with the 8" Toshiba without eye fatigue or being distracted by the resolution. But I'm also a bit old school having used computers for years where 72dpi was the standard and you could literally see pixels. The Encore 8 and 10 are 168 and 145 Ppi (pixels per inch) respectively. You can’t really "see" pixels. But there is a crispness to something like ipad retina that you don't get with these low ppi screens. I tested PDFs up to and over 100MB. The device handled these files well allowing fluid browsing, page flipping, zoom and pan. Unsurprisingly, a lot depends on the software. The built in MS Reader and the Drawboard app worked great. Adobe Reader (free acrobat) chugged a bit. I don’t like Adobe Reader anyway. In MS Reader and Drawboard, once the files were loaded (I was loading from OneDrive cloud) things were very smooth. On the largest files with lots of pages the preview index (thumbnails) took a while to load. May be 30 seconds for 80 pages. The Pen is great. The slickness of the raw glass can make tiny handwritten margin text a little shaky but certainly legible. I hope a matte screen protector will help that. But basically underlines, hand notes, text notes, highlights, all worked great. 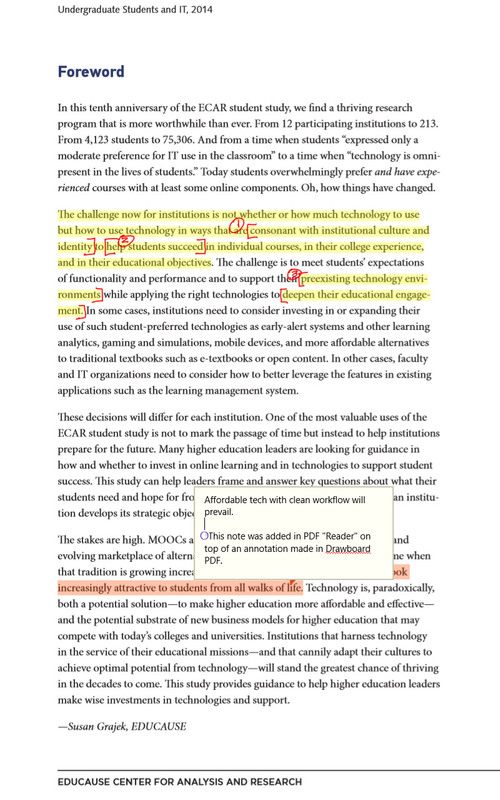 The ability to open a cloud pdf document, annotate it, save it back and then open it on other devices with annotations worked well. I quite like the Drawboard app for annotation. Expectations: Exceeded. I ventured into this just to explore the Encore. I will certainly use the device for annotation on airplanes or even in "leanback" mode on the couch. I have a bunch of tablet PC experience and iPad experience. I have had Macs too. I have used my iPad 3 with Goodreader for storing a library of PDFs and doing a small amount of annotation while traveling. I would say I am a casual user of the annotation functions while mobile. It is not essential to my workflow. Typically if I am doing research and consuming documents like PDFs I'm at a desktop environment with multiple monitors open and a desk scattered with paper printouts. But when traveling I do use both my iPad and my Fujitsu13" convertible for viewing and annotation. I'm not a annotation connoisseur and I had never used Drawboard before this test. The handheld mobile reader/notebook experience is good on the iPad from the multi touch tablet standpoint. Obviously the stylus situation leaves a lot to be desired on the current iPad. I have about 25 both passive and active capacitive styluses for my iPads and none of them are great for note taking. I also do some art. I think precision handwriting is way harder than tablet art. By the way, I'm dictating all of this text into an iPad 3 in OneNote (which then syncs with my windows devices) while doing the annotation testing on the Encore. Dictation may explain the length of this doc. Speech recognition for me seems much more natural with a tablet then either virtual typing or scripting with a stylus. The built in speech recognition in iOS keyboard I have found to be very reliable as long as you're connected to a network. The built-in dictation in Windows 8 is just barely okay and I have not installed Dragon on this new Encore tablet and I am not sure that I will. Obviously the text on a retina screen is going to be substantially sharper than on the Toshiba encore. The retina is beautiful while the Encore is acceptable. I appreciate the tradeoff of lower price processor, efficiency, heat, battery life, etc. of Toshiba's choice to put in a lower resolution screen. Low cost screens will get better every year. But keep in mind that we've become spoiled fast with the last couple years of high rez screens. Retina is nice but it didn’t change my life. If it changed yours and you are super sensitive to screen resolution then you should be cautious of the Encores. But they are better than iPad1's PPi and way better than what most of us were using 5-6 years ago. Windows 8 has a built-in PDF viewer, I already had full version of OneNote on the machine, I downloaded a copy of Adobe Reader XI (free Acrobat reader), and I also downloaded Drawboard PDF which seems to be the most popular PDF reader for the Windows 8/modern interface. Let me quickly eliminate OneNote from this discussion. As best as I can tell, reviewing PDFs in OneNote requires that the PDF be essentially printed into the OneNote format which means it is very difficult to get the annotations back out in a proper PDF annotation later. I tried it and it all works OK on this Encore but I think it merits a separate conversation since it is not really staying in the PDF format and there are other idiosyncrasies. The built-in default application, Reader, worked beautifully at viewing all of the files. Even the large PDF on the future of gaming, which is mostly graphics, flowed nicely and I could flick my finger so that it scrolled for five or six pages and the device would catch up and render the graphics. If you pinch the screen, the document goes into light table mode so that you get little thumbnails of all the pages. Again the Encore had no problem keeping up with even the large file. All of the docs loaded into reader but that's about where the fun ends. I have trouble with Reader even on my full-size i7 computer. 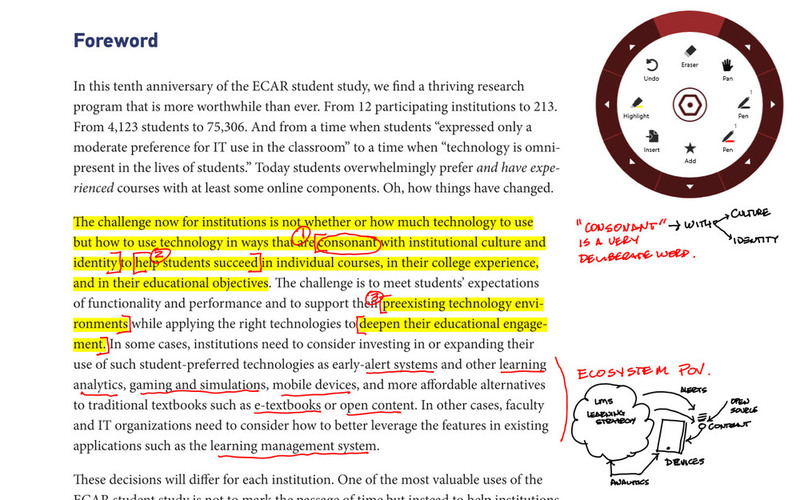 Highlights and written note annotations work but not great, hand scribed annotations are glitchy and unreliable. This is not the fault of the Encore 8. I have the same issues on every computer I've tried the new versions of Reader or Acrobat. It might be user error, but either way it's consistent. Drawboard is a metro/modern app. I have never use this piece of software before. I set it up to access files from my one Drive account so that I could also experiment with sharing the PDFs with other devices. Drawboard was able to open all of the files, even the large gaming report and was able to scroll through all of the pages with reasonable ease. Drawboard has a white table mode with small page thumbnails. It took 20 seconds or so for the device to generate the thumbnails the first time, but after that the pages were cached and anytime I returned it to the index it redrew quickly. Multitouch zoom and pan work very smoothly on all files..
All annotation features work as advertised regardless of the file size. I was able to save the annotated PDFs back into my one drive where I could open and view them including the invitations on both my laptop and iPad. Presumably you could do the same thing with any cloud Drive service but I did not drive with any others. I've had this little tablet just a week but I've pushed it pretty hard. The device never crashed during PDF testing. The 8 inch screen is small for some eyes and the text is not as sharp as on a retina screen. But certainly this device is very functional for reading and annotating PDFs. Multitouch zoom and pan is smooth enough that you can zoom into the margin to make handwritten notes at a reasonable scale and then zoom back out . Any small glitches that I saw I can't attribute to the Toshiba device itself. It seems more likely that there are glitches in the stack of applications cloud services and even the OS itself and when you stream all of these together you can get some small lags and hiccups especially with auto syncing. The devices cost $349 and $399 respectively. That's damn affordable for a lot of capability. But it's not going outperform a Surface, iPad or top of the line Samsung. It's not going to be the coolest bit of tech jewelry people have ever seen (though if they are Wacom enthusiasts you will get attention). Get your expectations in line. Mine were exceeded. But I've had my tech heartbroken more than a few times so I have very realistic expectations. You better be pretty familiar with the windows 8 interface and ecosystem. If you are not, then just that learning curve is going to cause some frustration compared to android or iOS. Windows 8.1 is a much more complex and capable environment. If you already use Windows 8 and understand the difference between modern and desktop then this may be easy for you. In my opinion the mobile OS tablets all suffer from some common issues. 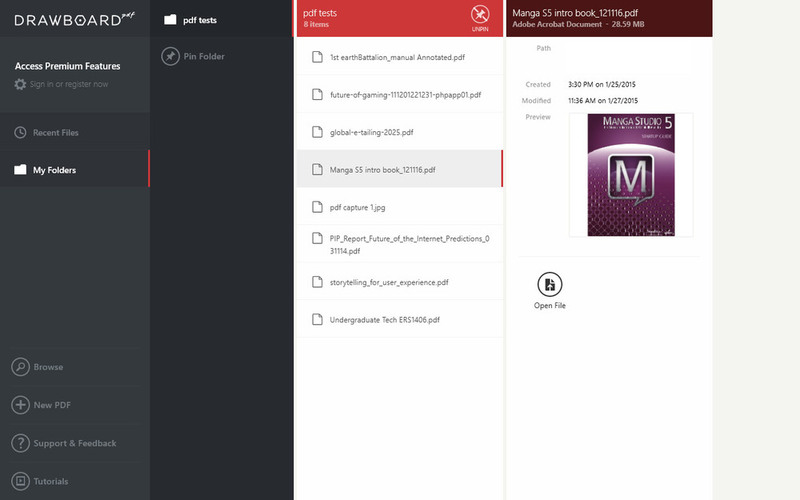 iOS, Android and windows modern/metro have a clunky interfaces for file management. This can become a real speed bump in your workflow especially if you're trying to collaborate with others in a multi computer multi OS kind of environment. Obviously there are workarounds but they all take additional learning and time to make them second nature. Drawboard surprised me to the upside here. Syncing through Microsoft OneDrive made the whole thing work really well for automagically sharing to other devices. Trying to do PDF reading and annotation on a small screen in Adobe Reader or Acrobat in the desktop environment would make me crazy, on ANY hardware. If you're already a diehard iPad person, you might just wait for the rumored iPad pro comes and see if it includes an OS integrated stylus. If Apple does that it will be a beautiful thing. If they don't, Microsoft is going to start eroding the iPad market for anyone that needs a stylus. This new Wacom pen is very promising for the Windows platform. The Wacom stylus certainly makes a big difference for hand notes and hand annotation. It doesn't make much of a difference for finger drag highlighting. But if you are looking for reasonably priced digital note and doodle pad that can run some desktop software then Encore is a good candidate. I did this evaluation out of curiosity and to better understand the limits of the device. I feel confident now about using Drawboard with the PDF annotation tools where I need a small format tablet. My last comment about the Encore in general - If I lost this device tomorrow I would order another one immediately. All screens shown at full pixel resolution 1280 x 800, unretouched. Some .jpg compression of the captures required for posting may be causing fuzziness. Actual screen dimensions are 6.75" x 4.25" and the image may appear larger than actual size on your screen. I am trying some edge case things to give people in the forum a sense of what the Encore 2 Write is capable of and where are its limits and breaking points.Just because one *can* do the things I'm showing here does not mean you *should*. I am not recommending this device for anything beyond a companion tablet for professional artistic workflow in this evaluation. This Encore is not going to replace a primary computer. If anyone is looking at these tests and thinking that I'm implying you could do hi resolution paintings all day for a living on it, you are mistaken. In my opinion, This tablet should not be expected to serve as a primary machine or attempt to be used for critical path and graphically demanding, processor intensive, professional work. This is a spectacular little device for the kinds of sketches, color comps, notes, and concept work that goes on behind-the-scenes of professional creative work. I am surprised and delighted at how far this encore can stretch but this is not a production machine. I hope I speak the obvious, but I'm never sure who's scanning through these forums and thinks they hear some enthusiast reviewer is recommending $350 8 inch Atom tablet is going to solve all of their needs. Expect too much of not just this product but the whole product category (low cost pen tablets) and you will be disappointed! I'm assuming my audience for these reviews are fairly technically sophisticated and informed computer & tabletpc users. It is the precision of a stylus on a small device like this Toshiba that allows for such a tiny strip of buttons to actually be usable. IMO programs like MS5 or Photoshop are massively frustrating to use in a pure tablet environment without a toolbar of some kind to manage a few essential keyboard shortcuts. For Toolbar Creator fans: I'm right handed. I've been increasingly finding that I like my buttons (and app ui) on the right side of the screen if I'm interacting with Ui by pen and not touch. That way I can hold the Encore in my left and I don't have to reach across the page to do a selection, blocking my view of the brush size preview) The TAB key and the little brush slider at the top right are really useable even at 30 pix on this little device. Pictured here is a screen capture of my MS5 stress test in its completed state. Forgive the crudity of the diagram. I didn’t plan it out, I just started painting crap. The objective wasn't a nice painting it was to performance test the Encore. This is a 4000 X 3000 pixel canvas with 11 layers. Layers are mostly bitmap with one vector layer and one 3D layer. Two of the Bitmap layers have live channel operations (multiply and screen). In its final form it is a 49.5 Mb file. The background was put down in multiple gradient layers and Encore was able to fill these gradients with little delay. Chrome pipe was blocked in a single stroke with a 500 px Gpen from back (small) to front (fat). I erased out edges to clean it up, locked pixel transparency then painted in a chrome effect and some reflections with a 50 to 200 pixel oil paint brush. 3d chair and 3d soccer ball were added, rotated, and moved into place. These objects loaded fairly quickly and while they are rotatable and resizable in space, they are laggy and you can tell that the machine is having a bit of trouble with swapping the 3D controls and managing the refresh. It doesn’t glitch it just lags - a lot. I don’t expect to use much of the 3D in Manga on this machine. But in a pinch it will work with patience. Frankly I'm surprised it works at all in this large file. On the background layer I loaded a repeating tree stamp brush and painted a forest effect. Touch of lag but acceptable. I added a vector layer and a 100 pixel red vector "rough ink" stroke was added to the bottom of the page. It lagged a touch (not even a second) but felt very controlled. I washed the "simplify vector" tool over the vector stroke and it took about 4 seconds for the machine to calculate the task. Vector editing was tested and worked fine. Colors of the rainbow were added in a new layer with separate colored strokes using a 160 pixel watercolor brush. Touch of lag, no problem. I performed a 200 pixel Gaussian blur of the rainbow on the entire layer. This took 10 - 15 seconds to calc. Layer type was set to "screen"
Using a blur tool I softened the back of the chrome tube and its edges with a variety of brush sizes ranging from 100 to 20 pixels. I was zooming and panning and rotating to do this. It's starting to get laggy but still manageable. So far so good. Let's see how the current file load affects brushes now. I selected a Barbed wire paint brush and with a single fast stroke went from back to front creating a coil. No significant lag. I then erased the wire behind the pipe. Call-out notes and call out shadows were added in separate layers. The file did not crash at any point. Multitouch pan and zoom still works acceptably though not quite as fluently as with a smaller file. Large brushes of 300 pixel are now very laggy but we will still accurately follow a slow draw. Just to put a little frosting on this demo cake, the whole time I was doing the Manga painting I had OneNote open in the background with several notebooks open, connected to OneDrive, Wi-Fi on the whole time. In the screen capture below I have task switched over to OneNote done a few things and then brought up the task manager. You can see Manga Studio's memory footprint in the list of open applications. Even though I had this large file open in MS5 it did not degrade the performance or usability of OneNote. >>> So…Where does Manga Studio "Break" on the Encore 2 8"
The short answer is, "I don't know". It never really broke. It chugged at larger file sizes. On one test I had a 1920 x 1080 canvas with 6 layers and I loaded one of the larger MS5 library articulating human Figures. These are fairly complex poseable 3d .obj models. This one is about a 15Mb file with textures. The screen blacked out when I dropped in on the canvas. I thought I'd finally crashed it. After about 40 seconds the screen refreshed and the model was loaded, moveable and poseable - although REALLY chuggy. I create a paint layer on top of the 3d layer and a 50 pixel brush showed no noticeable lag. In my experience So far, the Encore 2 is quite happy with canvases of 1600 X 1200 or 1920 X 1080 and 5 to 10 layers. At these canvas sizes brushes of 50 or 100 pixels, regardless of the pen or brush type, seem to be able to keep up with the stroke just fine. Larger brush sizes of up to 500 pixels have lag but with just a little bit of patience they are usable brushes. As I've shown in one of my other posts (http://forum.tabletpcreview.com/thr...wt8-b-encore-2-write.63815/page-4#post-425121), brushes of up to 1000 pixels require a very slow and deliberate stroke but the paint still registers to the path with full pressure sensitivity. If you scrub the screen as fast as you can with wild strokes using a very large brush you will break the stroke tracking. But I have still not seen that kind of behavior crash the application or the machine. As I pointed out in other forum posts, and I'll reinforce here, this little tablet has exceeded my expectations and delighted me given my expectations of it as a low-cost, lightweight, atom processor tablet. I am not trying to do mission-critical work with it. I see it as a very personal mobile sketchpad and note taking device. Paired with Manga Studio and with the small tweaks like a toolbar this little device comes the closest to a portable full color paint kit/sketchpad as anything I've ever had my hands on. Obviously other tools and apps like Sketchbook Pro work great too. * FYI: Review dictated into iPad OneNote in parallel to painting on Encore. Generally the OEM apps from everyone but Apple, Sony, and Microsoft are second rate and I tend to ignore or uninstall those kinds of things. The Toshiba Apps aren't much of an exception. I didn't intend to evaluate these because I always consider this stuff "throw away" except for the vendors I mentioned so these don;t figure into my eval. Though its curious to see how much Toshiba touts this stuff in the marketing. Toshiba's audio recorder App is called Tru Recorder. 3/10. It claims to distinguish voices in the recording and color codes individual speakers in the playback display. That feature is not working for me. The quality of the audio is poor. Very "aliased" and compressed sounding. I don't know if its the Array microphones, or the audio codec, or something else. My Samsung s4 and iPad both have far superior audio and audio apps. This is a very simple note taking app. Its got some some nice features but its not a pro tool. If you have OneNote desktop I can't imagine why you would use this instead. As a simple app, One Note/metro is better. As a pro tool, desktop OneNote is an order of magnitude more sophisticated. There's no reason to get this device for professional or serious student notes and not have full OneNote. The ecosystem of Onenote including cloud drive and interoperability with all platforms is very mature. If you have a new iphone, android or ipad download the free version of OneNote. Dictate into OneNote using the built in speech recognition of android or iOS keypad. Save it to a synced folder and you can view it near instantaneously on a PC. Take handwritten notes or doodles on this little Encore and view them on your full sized desktop in seconds. This is what we have been promised for along time and its starting to work really well with Microsofts release of the free ONeNote Apps. It works. The camera isn't anywhere near as crisp as Samsung S4, iPhone or iPad. The camera App itself doesn't do much. You can start it up from the lock screen by swiping down. 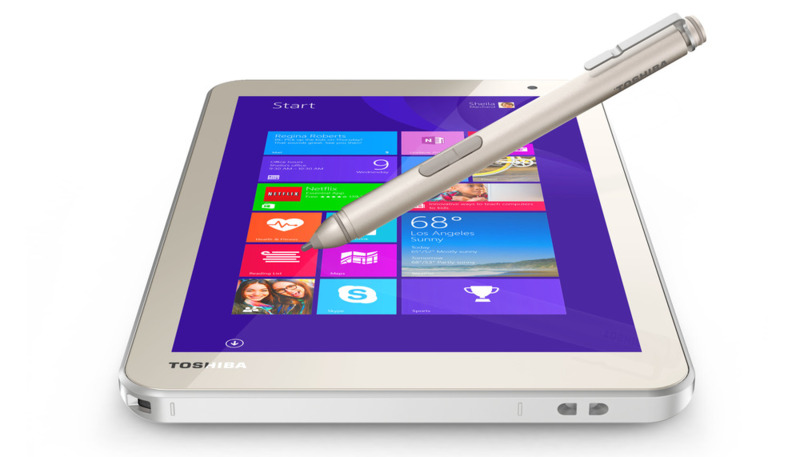 TOKYO and LAS VEGAS, Jan. 6, 2015 /PRNewswire/ -- Wacom Co., Ltd, announced that Toshiba America Information Systems, Inc. and Toshiba Europe GmbH have adopted "Active ES" pen technology, Wacom's unique capacitive pen solution, for their new Windows 8.1 tablets, the Encore 2 Write (exhibited at CES in the Central Hall at the Las Vegas Convention Center, Booth #11028). Wacom leads the industry with its EMR® (Electro-Magnetic Resonance) digital pen sensor solution, and reached 100 million units of component production (cumulative) in April 2014. Wacom has now extended its technology portfolio by adding the "Active ES" pen solution to address broadening needs for pens in mobile products. The Active ES pen solution handles high performance pen and multi-finger touch inputs simultaneously with a single sensor and a single ASIC controller. It realizes a natural and intuitive writing experience with high speed, precision and pressure sensitivity. By supplying both Active ES and EMR pen solutions, Wacom continues to accelerate digital pen use on mobile devices such as tablets and smartphones, and lead the way toward the era of digital stationery. "Toshiba's Encore 2 Write tablets and TruPen stylus proves that Wacom's Active ES solution delivers a best-in-class writing and drawing experience, with accuracy and speed never seen before on tablets," said Masahiko Yamada, president and CEO of Wacom. "Our Active ES pen supports writing, drawing and editing in intricate details with pressure sensitivity, as well as flexibility in design and configuration for OEM partners." Toshiba's new tablets running Windows 8.1 Update with Bing are ideal travel companions, delivering a powerful Intel® Atom™ performance to help users get the most out of their day. The "TruPen" stylus brings high precision control to your work -- taking notes in meetings or lectures without sacrificing the writing feel of pen on paper, regardless of speed. The TruPen is also ergonomically designed, making it comfortable to hold over long periods of time. Thanks to its pressure-sensitive tip, users are always in complete control of every line they write or draw. Furthermore, each model's elegant design features a special slot for attaching the pen to the tablet, so it's always handy for jotting down ideas or developing to-do lists. By promoting the adoption of feel™ technologies in a variety of mobile devices, Wacom partners with industry leaders in making the world a more creative place. LAS VEGAS--(BUSINESS WIRE)-– Toshiba’s Digital Products Division (DPD), a division of Toshiba America Information Systems, Inc., today announced its Encore™ 2 Write tablets featuring a pressure-sensitive pen and an ultra-responsive screen for more paper-like precision. These progressive devices are the first Windows 8.1 tablets to feature latest-generation feel™ pen technologies by Wacom®, enabling new productivity possibilities for everyday users, while delivering well-balanced performance in a thin and light form factor with great battery life. Available in 8-inch and 10.1-inch diagonal screen sizes1, Encore 2 Write tablets are available for a starting price of $349.99 MSRP2. “Whether you’re a compulsive scribbler, sketch artist or simply prefer handwriting notes in meetings, this tablet features technologies that make writing on screen feel more natural than ever. And because it’s a Windows tablet, it’s compatible with your favorite Office programs and apps, so you can get going right out of the box,” said Philip Osako, senior director of product marketing, Toshiba America Information Systems, Inc., Digital Products Division. Toshiba’s exclusive TruPen™, included with Encore 2 Write tablets, is a “pro-grade” pen with a fine tip and 2,048 levels of pressure sensitivity, enabling sharp strokes while minimizing lag for greater precision and accuracy. In hand, it virtually feels as natural as writing on paper. Encore 2 Write tablets include a one-year subscription to Microsoft Office 365 Personal3, featuring full-versions of the latest Office applications, including Word, Excel, PowerPoint, OneNote and Outlook. Work online or offline and keep files in sync across devices with unlimited storage through OneDrive. Toshiba’s powerful yet easy-to-use note-taking app lets users effortlessly take lecture or meeting notes, make markups on photos and graphics, draw, doodle, paint and more. Featuring an all-new user interface that works with Microsoft Office, TruNote makes it easy to switch pen colors and textures, import images and photos, and organize notebooks. The app’s search functionality intuitively finds handwritten characters in any note4, and any text, drawing or image can be easily selected and exported into Word, PowerPoint or Excel. In addition, left-handed users will love the app as it features a mode that switches the menus from the left to the right side of the screen. Use the tablet’s built-in high resolution 8MP camera to capture notes from textbooks, blackboards, whiteboards and chalkboards and automatically straighten, sharpen and brighten the text for greater readability, which can then be imported into TruNote. It also features character recognition to quickly and easily extract information from printed text. The next generation of audio archiving, Toshiba’s powerful TruRecorder app makes it easier than ever to record meetings, lectures and conversation and revisit them later. TruRecorder can parse the audio of a multi-party conversation, differentiating each speaker’s unique voice, and make it available for selective playback, providing an icon for each speaker. Powered by the quad-core Intel® Atom™ processor and 2GB of RAM5, Encore 2 Write tablets provide all the performance and speed necessary for getting work done all day as well as fast start-up, browsing and multitasking in Windows 8.1. The tablets offer up to an 11-hour battery life6 for general usage and up to 8 hours of video playback. Stereo speakers plus Dolby® Digital Plus audio provide an immersive audio experience, while 802.11n dual band Wi-Fi® offers speedy streaming and smooth browsing. Encore 2 Write tablets additionally make it easy to enjoy content on compatible HDTVs with a built-in Micro HDMI® port (available on the 10”) and wireless display support right out of the box. The tablets also feature 64GB of storage7, a full array of tablet sensors, including GPS, accelerometer, gyroscope and e-compass, a micro USB 2.0 port for powering the devices plus easy syncing and sharing with smartphones as well as a microSD™ card slot that supports up to 128GB cards to expand the storage capabilities. 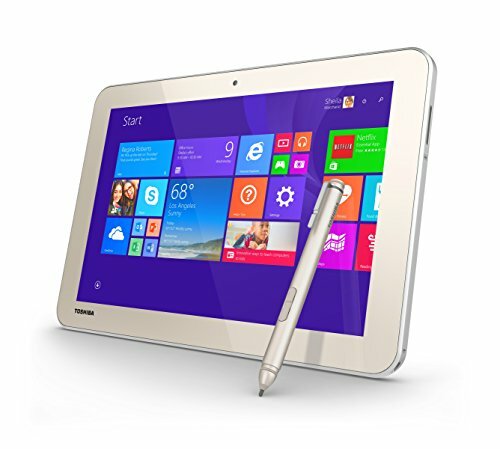 The Encore 2 Write tablets will be available for purchase starting on January 11, 2015 at select retailers, including Microsoft Stores and on toshiba.com/us. 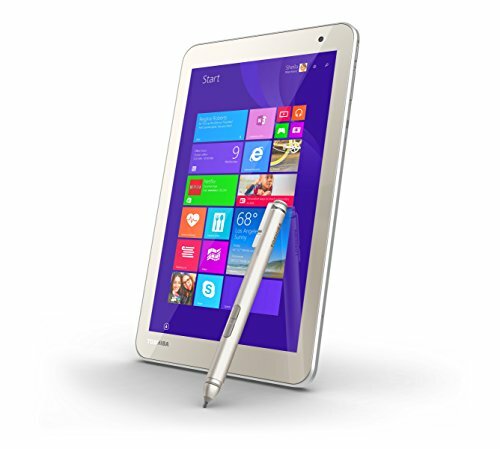 The 10.1-inch Encore 2 Write is priced at $399.99 MSRP and the 8-inch model is priced at $349.99 MSRP.